I still remember the day I learnt that Noey would have to wear spectacles. He was in the early months of Primary 2 when he nonchalantly came home with a slip from the school health check indicating that he would have to go to an optician for a further evaluation. It did seem inevitable, considering how much of an avid reader he is, and the number of times I have had to bark at him for reading in the dark! But I did hope that he would be able to hold out for longer. Not only because having to wear spectacles was an inconvenience, but also because I knew that the later the onset of myopia (ie. short-sightedness), the less likely he was to develop high myopia in adulthood and suffer it’s accompanying risks. A person with short-sightedness of a power higher than 500 degrees is considered to have high myopia, and is a higher risk of developing a bunch of scary eye diseases and ailments like retinal detachment, cataracts, and glaucoma, all of which can cause blindness. Eeeks. Noey started off with his spectacles quite happily and I was quite relieved that his power was still fairly low and below 100 degrees for both eyes. He was chuffed to be able to see clearly again, but it didn’t take long for the novelty of spectacles to wear off. He would complain of them hurting his ears and slipping off his nose. And of course, he regularly misplaced them, resulting in the whole family being regularly roped in to hunt for his spectacles in the mornings. Then one day he got hit by a stray ball while watching his classmates play football during recess. The ball hit his spectacles, causing them to be damaged and worse, giving Noey a cut near the eye. That scared him so much that he shied away from ball games and when he did play, he refused to wear spectacles. He didn’t like to wear his spectacles when he's at home either, since he felt that he could see well enough. But I really didn’t like that since I felt it could cause his eyesight to deteriorate faster. It sounded like a bit of a miracle when I first heard of Orthokeratology (or Ortho-K, in short). It was an intriguing concept — that you could wear a pair of cornea-reshaping lenses overnight, take them off in the morning when you wake up, and have perfect eyesight for the day. It would be like getting your eyesight restored! 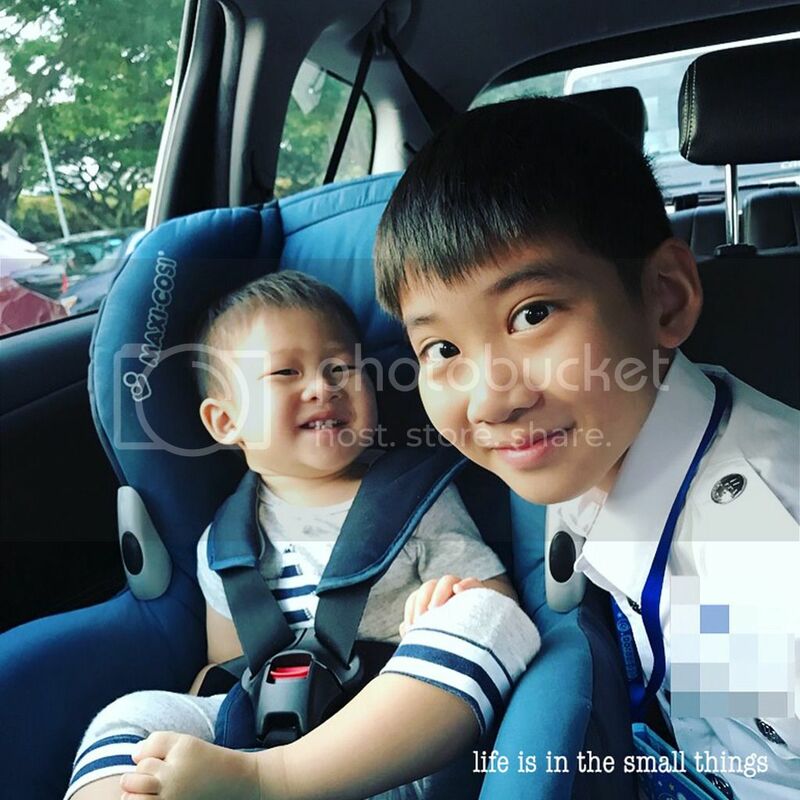 Moreover, I learnt that studies have shown that use of Ortho-K lenses can significantly slow down the worsening of childhood myopia, thereby protecting a child’s eyesight. Given the benefits, I was very keen to give Ortho-K a try, but I had some concerns. Firstly about how safe the procedure was, and secondly about how Noey would take to wearing hard contact lenses to bed. This is a boy who had some sensory issues at a young age and for whom comfort is very important, and I was afraid that he would reject them. My concerns were put to rest after a visit to W Optics flagship store at Suntec City. 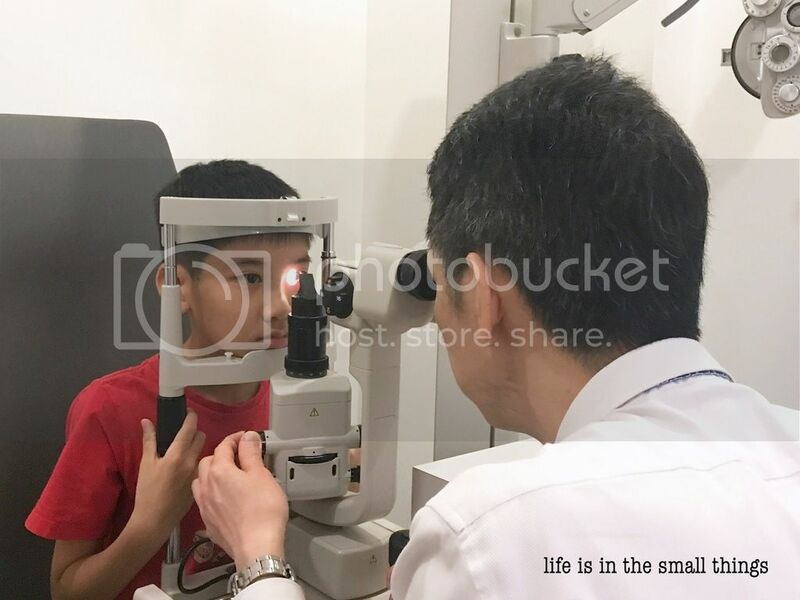 I was glad to learn that W Optics Suntec City has a Myopia Control Centre where consultants would assess my child’s history with myopia and his lifestyle and make tailored recommendations on how best to prevent his myopia from worsening. From them, I learn that Ortho-K’s corneal reshaping therapy treatment has a 70-year history. I was also comforted to find out that the current gas-permeable hard lenses used for Ortho-K have been approved by the US FDA for overnight wear. 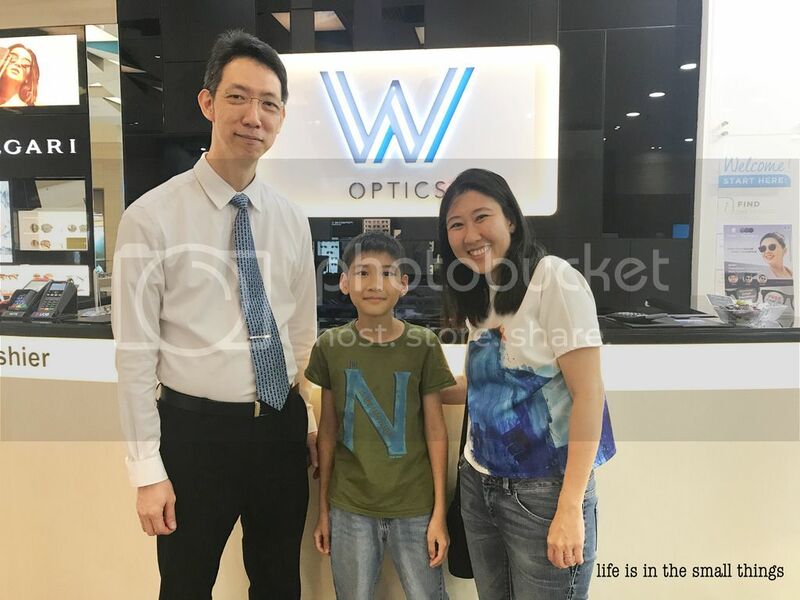 The W Optics optometrist who attended to us was very patient with Noah, showing him the proper way to handle and wear lenses, and giving him the confidence and motivation to want to give Ortho-K a try. 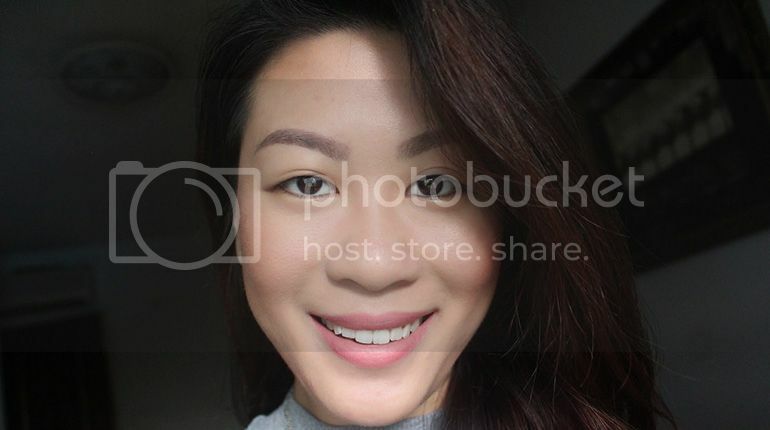 Noey has been using the lenses for nearly two months now and the results have been very positive. After the first wear, he woke up overnight to perfect vision. I think I was as excited as he was! We went back immediately the day after that first fitting to W Optics as part of his Ortho-K follow-up ensure that everything was fine, and it was. Noey really relished having perfect vision and was super motivated to keep up with the regime. The lenses did take some getting used to, especially for a sensitive child like he is. For the first month or so, I had to be present to help him with eyedrops to lessen the discomfort and when he put on his lenses. The good thing was that he found them less of a bother when he closed his eyes to sleep so it ensured that he went to bed quickly! I also had to supervise him to ensure that he cleaned his lenses properly to avoid the risk of infection. 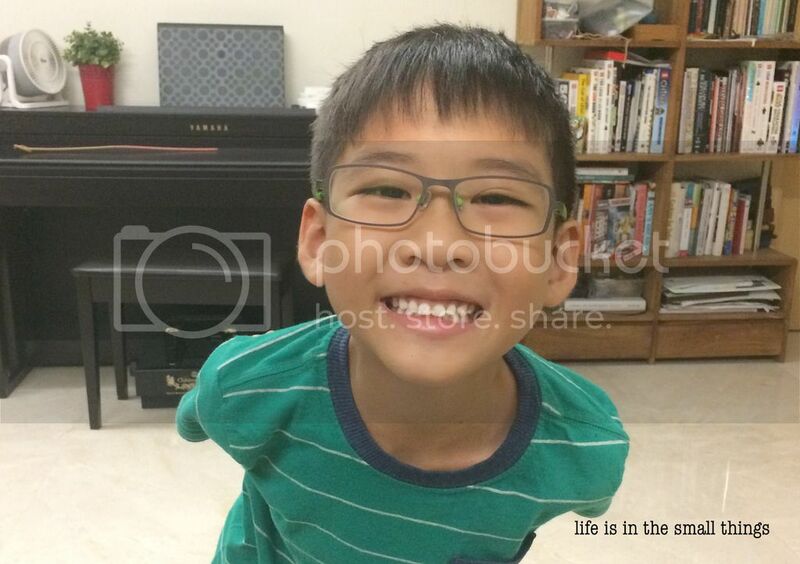 Now after two months, he is able to handle all the lens insertion, removal and cleaning on his own. He is also more comfortable with his lenses. We have also found that the perfect vision effect lasts for 1.5 to 2 days for him, so he can take “rest days” from his lenses about once a week. I asked Noey if he was happy to continue with Ortho-K, the answer was a resounding “YES!” To him, having to wear the lenses to sleep is a small price to pay for all-day clear vision. As for me, I am happy that his myopia is being kept under control for now, and that any future increase in his power should hopefully be more gradual. I have had quite a few questions about Noey’s experience with Ortho-K since he started so I’ve jotted down a short FAQ for those who are interested. 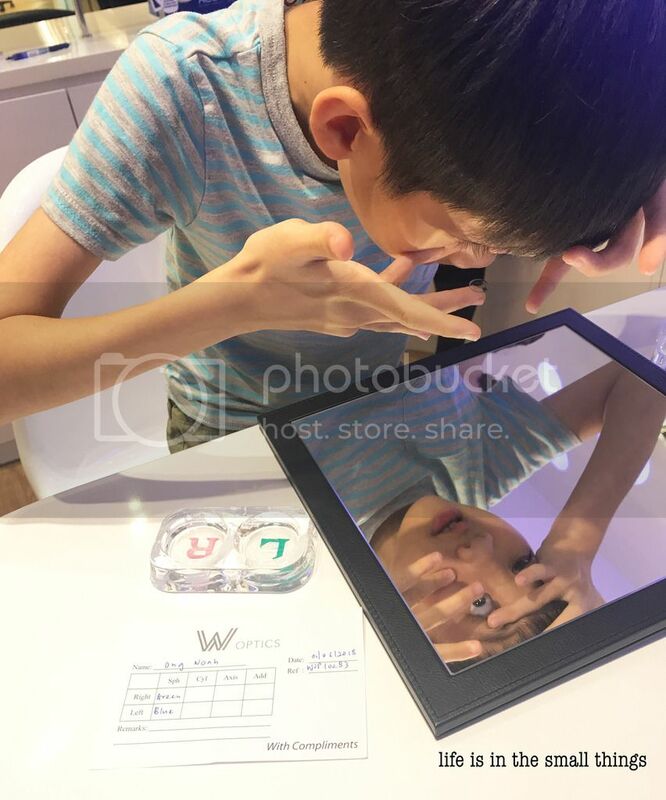 These are based on my personal understanding under the advice of the optometrist from W-Optics but do seek your own professional advice if you are keen to explore Ortho-K for yourself or your child. Both kids and adults can benefit from this treatment! Orthokeratology or Ortho-K is a corneal reshaping therapy that involves the wearing of specially customised hard gas-permeable lenses to sleep. When worn, these lenses gently shape the curvature of the cornea to improve vision. When these lenses are removed in the morning, most wearers should have perfect vision which would last the whole day. The lenses used in Ortho-K are special gas-permeable lenses, making them safe for over night use. Ortho-K is also a non-surgical therapy where the corneal reshaping that takes place is a reversible process. If you stop wearing the lenses, your cornea would simply revert back to its original state. Of course, with all use of contact lenses, proper maintenance and cleaning of the lenses are necessary to keep them safe and effective. The therapy is suitable for children from age 6, but of course, this also depends on the maturity of the child to be able to handle the day to day needs of putting on the lenses, taking them off and cleaning them. Ortho-K is particularly beneficial to kids for myopia control, since the therapy has been shown to slow down the progression of myopia. That said, whether an adult or child is able to undergo Ortho-K also depends on the condition of the person’s eyes. Do seek the advice of an optometrist on this. The clearest and obvious benefit is the perfect vision that you will enjoy during the day. 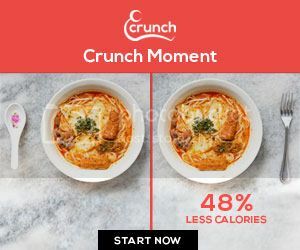 This is especially great if you live an active lifestyle and would enjoy the convenience of clear vision without the hassle of spectacles or contact lenses. Noey has found this particularly satisfying at the pool and has relished being able to see clearly in the water. The other benefit for kids is myopia control as mentioned previously. The cornea reshaping effect of the Ortho-K lenses helps to stabilise childhood myopia and slow down the rate of deterioration, and accordingly reduce the risk of eye disease and ailments down the road. Ortho-K has generally been found to be safe, having a long history of more than 70 years. as mentioned earlier, there is always the risk of infection when wearing contact lenses, particularly if your lenses are not regularly cleaned, disinfected and maintained well. At W Optics, regular follow-ups are part of the treatment to check on eye health and ensure that there are no issues with the lenses. At W Optics, one cycle of Ortho-K treatment is for a period one year. During our first consultation, Noey’s eyes were assessed for their suitability for Ortho-K. After determining that he was suitable and willing to go ahead, measurements were taken for the Ortho-K lenses to be designed. Our second consultation was after the lenses had arrived. We went for the fitting and were taught how to wear the lenses, as well as how to clean and store them properly. Our third consultation was the day after wearing the lenses to bed for the first time. This was to allow the optometrist to check that fit of the lenses and how effective they were. Thereafter appointments are scheduled a week later, a month later, then 3 months later and 6 months later for regular follow up. Each time Noey’s eyesight is tested and the corneal reshaping analysed. His eyes are also checked for their health. The optometrist would also ask him to bring his lenses along and the lenses would be checked to ensure they are still in good condition. How long do you have to continue with the Ortho-K treatment for? It is recommended that for effective myopia control in children, the child continues with the Ortho-K treatment until he is in his teens, when myopia would typically stabilise. After that, you and your child may decide whether to revert back to wearing spectacles, or switch to contact lenses, or opt for corrective eye surgery, or even to continue with Ortho-K indefinitely. Ortho-K is low risk because it is a reversible process so while it offers no permanent “cure” for myopia, it can greatly assist in ensuring that a child who has started on Ortho-K retains much of his vision in the long term. How much does Ortho-K treatment cost? At W Optics, Ortho-K treatment starts at about $1,800 though this depends on the complexity of each case and the degree of myopia sought to be corrected. This treatment cost covers the lenses and also a series of regular check-ups over the course of a year to ensure that the treatment is proceeding successfully. If you would like to find out more, do approach W-Optics for a consultation. With our attending optometrist, Mr.Temasel Alex. Thank you W Optics for the perfect vision!